Pulsing is a jigsaw variant that allows students to benefits from the “hive” mind, but also insists on individual accountability in terms of project and task completion. I use pulsing a lot for research…. I have attached an example I used with a grade 7 class doing an inquiry on creating a fully functional island with government, a people, culture, population centre, etc… . …and are vitally important in an educational landscape. See below. This week Google added a handful of new features to Google Slides. Some of them are features that teachers and students have been requesting for years. Please note that some of the following new features may not appear in your G Suite for Education account for a couple of weeks. All of these features are available now for users logged-in with a Gmail address. 1. Quickly insert pre-formatted timelines and other diagrams. Now when you open the “insert” drop-down menu you will see an option for diagrams. Choose that option and you’ll be able to insert a variety of pre-formatted diagrams including timelines. All of the content within the diagrams can be edited. 2. Add-ons for Google Slides. There are now seven Add-ons available in Google Slides. Those of interest to teachers and students include Lucidchart, Pear Deck, and Unsplash. Unsplash provides high resolution photographs to re-use for free. 3. Grid view of presentations. There is now a grid option under the “view” drop-down menu. This lets you see all of your slides in a grid and re-arrange slides by dragging them into different sequences in the grid. 4. Google Keep notes integrated into slides. Google Docs integrated Google Keep notes earlier this year. That allowed you to drag your Google Keep notes directly into a document. Now you can do the same in Google Slides. 5. Skip a slide without deleting it. If you are in the habit of duplicating your own presentations then deleting a slide or two for different audiences, the new “skip slide” function could appeal to you. This function lets you specify a slide or slides to be skipped in a version of a presentation. Skipping a slide doesn’t delete it, it just prevents it from being displayed when you’re in the full screen presentation display. Learning Technologies Support would like to take a moment to thank all the teachers and students who made this eBook possible. They have worked tirelessly and extremely hard to both learn the Seesaw tool and have continued to refining and perfecting already solid assessment for learning practices to fit with this new process portfolio/assessment for learning management tool. The examples shared, highlight various aspects of student & teacher learning reflected on in Nursery through Grade 6. It is exciting to see how insightful and detailed some of the reflections and insights are. We are beginning to see teachers and students making connections to outcomes and criteria in more purposeful, direct and meaningful ways during the reflection and posting process in Seesaw in Chapters 7, 8, 9, 10, 11, 12. This is not to say that this isn’t being done daily at the classroom level, rather the processes in place in the classroom have not yet fully transferred into the Seesaw environment. Hopefully, the training provided over the course of this year and next (also outlined in Chapter 2) will help with this. The examples in Chapters 5, 7, 8, 9, 10, 11, 12 also demonstrate current practices that one might expect to see in evidence in Winnipeg School Division classrooms today: Inquiry, Design Thinking, Computational Thinking, the 6 Cs, and so on. There is plenty of evidence of creative connections with parents in Chapter 4: conversations about learning, education, upcoming events, past events, & friendly, community building conversations. Mobile Learning seems alive and well. Chapter 3 highlights examples of App- & Media- Smashing where learners are demonstrating their creativity and inventiveness when designing and working on completing their tasks. It was encouraging to especially see examples where both various media (dance or clay) was used in conjunction with a digital medium (video or animation). 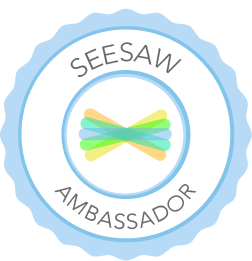 Overall, the Seesaw implementation is progressing well. Please use this resource as a guide to assist you and your class in creating powerful, learning focused, reflective posts guided by co-created criteria, outcomes and clear tasks for the Seesaw Learning Journals your students will be creating. If you would like to know how to “beam” your iDevice (iPhone, iPad, etc…) to a projector with a connected AppleTV then this tutorial may help. It was originally created for the folks over at WSD EAL and so is “localized” for that location. Every once in while, one participates in an event that has a lasting impact on the soul – not in a troubling way, but in a way that reaches out, delicately torches, in some cases embraces, one for the better. Today one of the strongest characters & most innovative teachers I know, asked me to be a “human book” and share a personal story along with 42 other human books in a massive sharing circle. It was breath-taking & awe-inspiring! And inside? My heart and soul reeled with hope as I watched students take in stories, share their own perspectives, not caring about their own differences or their issues, only wanting to share and talk openly about the story and the issue at hand. It was mind blowing how focussed and respectful participants all ages were. Many of my fellow “books” had props or artifacts to sustain interest. This was a really good idea, but not one that worked well with my story. I was my own artifact. A lot of the stories I heard were quite positive! I shuddered a bit because, while mine ultimately turned out alright, it was not exactly a rosy story! I fretted, but unnecessarily so! The participants didn’t judge MY book by it’s weathered old cover. Nor did they deem my story unworthy. Quite the opposite in fact. My message of facing challenges, staying positive and not giving up despite what happens on your educational journey seemed to hit home with many. And many were surprised that a teacher could have such educational trouble! This brings me to the part where I want to thank everyone, most especially Chantelle Cotton, for making this incredible experience possible. Today hundreds of people connected in a way that was beautiful, deeply appreciative, and wonderfully connected! The sense of community, peace and consecutiveness was palatable. We need more events like this!!! I have a new Twitter challenge going over the next SEVEN days. The 7 day Nature Photography Challenge is simple: The idea is to occupy Twitter with nature photographs every day for 7 days and to hashtag them with #WSD7dNC. That’s it really. My plan is to Storify the lot when were done as sort of an EARTH day tribute. We see how that plays out. I have been working on a HEAT VS TEMPERATURE simulation for a Grant Park coding challenge. The prototype appears below. I have limited the speed to 50 and the number of cloned objects to 50 as well. My temperature measurements at the moment are pure fiction and I would love some advice on formulas to make those more accurate. At any rate, the idea would be to have students generate the code to create the simulation in order to explore what happens to heat and temperature when you increase or decrease the speed and/or number of particles in a substance.